I know it’s not technically autumn over there in the Northern Hemisphere, but I’m a little over winter right now so to keep me happy can we just pretend it’s autumn over there and spring here in New Zealand? Ahhhhh. I’m feeling better already imagining all those pretty spring flowers and I bet you’re all feeling pretty darn awesome thinking about butternut pumpkin! Seriously the best thing about autumn (and you all get the fun of Halloween in autumn too, that’s pretty awesome too). Without fail, my two little boys will go stir crazy before dinner time, so the idea of making gnocchi on a weeknight with them running around feels more like an activity that should be reserved for CIA black sites than something I want to inflict on myself. But gnocchi on a weeknight can be done, we just need to cheat a little with some store bought gnocchi. I know that store bought gnocchi isn’t usually that appealing and generally turns into a stodgy mess, but here is my little secret to make it amazing. 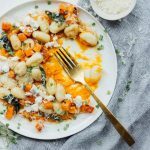 After you’ve cooked it, throw it into a non-stick pan with a little oil and you will have the most delicious gnocchi that’s fluffy on the middle and has a little crunchy crust on the outside. Then we make this gnocchi look seriously fancy pants. 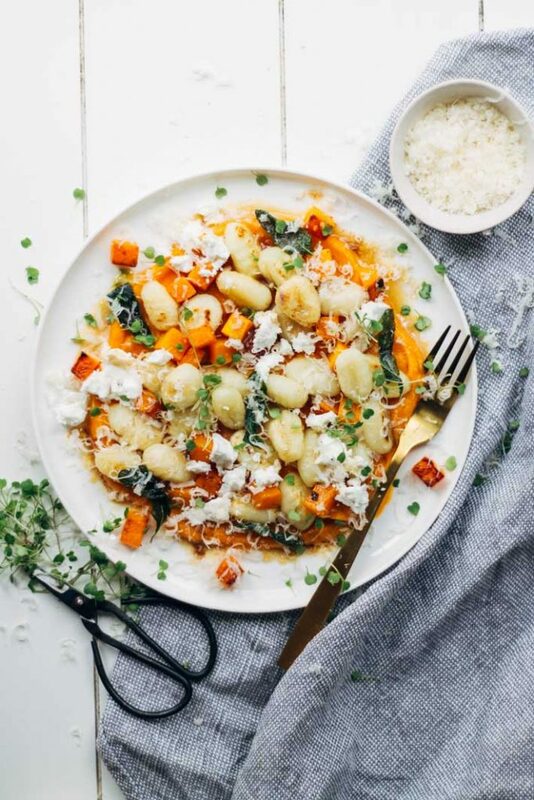 Smear some pumpkin puree over a plate and scatter over the gnocchi with some caramelised pumpkin, goat’s cheese, rocket (arugula) and parmesan cheese. Then drizzle the whole things with burnt butter because we all know that butter makes everything taste better! Especially nutty burnt butter. If you haven’t made burnt butter before don’t be daunted, all weren’t doing is cooking the butter a little longer than you normally would so that all the milk solids in the butter are toasted and turn brown. When you add the butter to the pan you’ll first see it melt, then start to bubble, then foam. When it’s foaming that’s your cue to add your sage and shortly after the butter will turn brown and it’s ready to pour over your pasta. This recipe gives you two pretty generous serves but you can always stretch it out to four by adding a poached egg and/or some prosciutto or, my husband’s favourite, crispy free-range bacon on top. 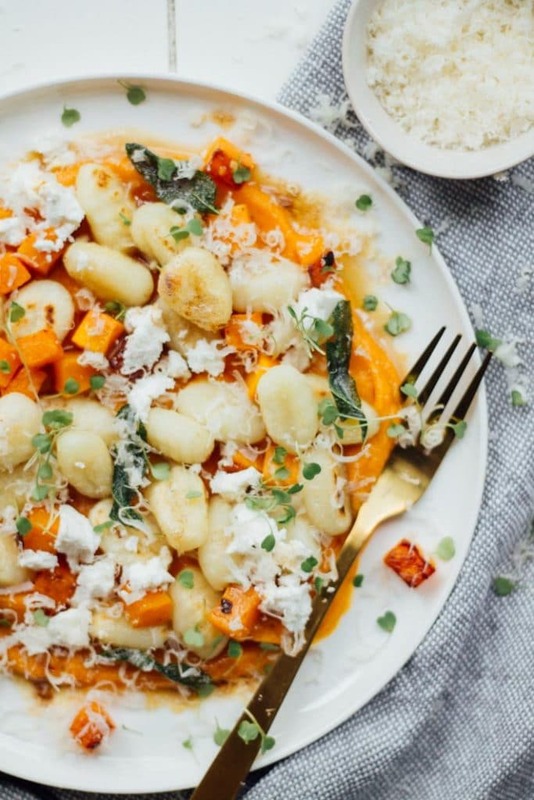 Okay, so you can do it, gnocchi on a weeknight! A comforting autumn dish that looks and tastes delicious. 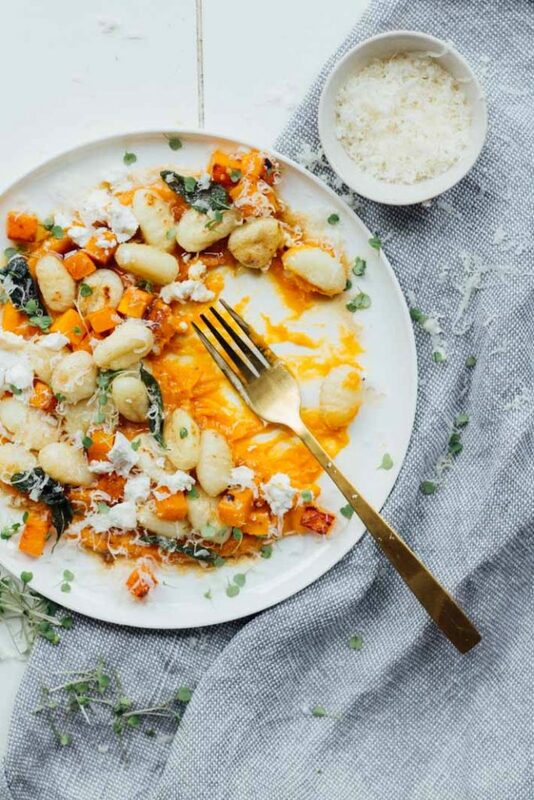 Gnocchi, butternut pumpkin, a little chilli, sage, goat’s cheese and parmesan cheese ready in under 20 minutes on a weeknight. Heat 1 Tbsp olive oil in a non-stick frypan (see note) over medium-high heat. 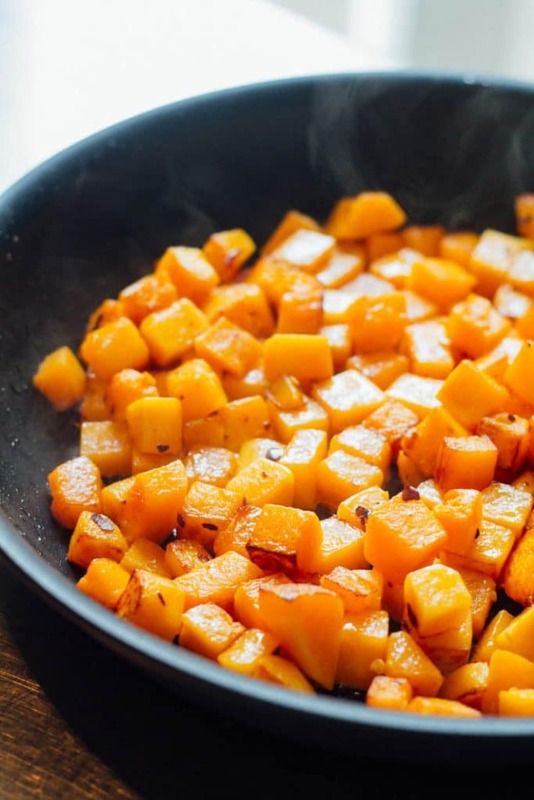 Add pumpkin and cook until starting to brown on the outside and soft and tender on the middle, about 10 min. Sprinkle over chilli flakes and salt and pepper to taste. Set aside 1/3 of the pumpkin. Take 2/3 pumpkin and place in a food processor or blender. Add garlic and 2 Tbsp water and blend until smooth. Set aside. Place frypan back on a medium-high heat and add remaining 1 Tbsp olive oil. We will use this to fry the gnocchi once it has been cooked. Bring a large pot of water to the boil. Add a couple of Tbsp of salt (you want your pasta cooking water as salty as the sea) then add the gnocchi. Wait for the gnocchi to rise to the surface (this indicates that it is cooked), about 2 min, then using a slotted spoon, gently remove and place in the hot frypan. Cook until gnocchi is starting to brown and form a delicious crust, 3-5 min. Remove and set aside. Return frypan back a medium-high heat and add butter. Allow butter to bubble then start to foam. As soon as it starts to foam add the sage leaves. The butter will quickly brown once it starts to foam. When the sage leaves are looking crispy and the butter is starting to brown remove from the heat immediately. Remove sage leaves with a slotted spoon and transfer to a piece of kitchen paper, they will continue to crisp up as they cool. To assemble, divide the pumpkin puree between the plates and smear over the bottom of the plates. 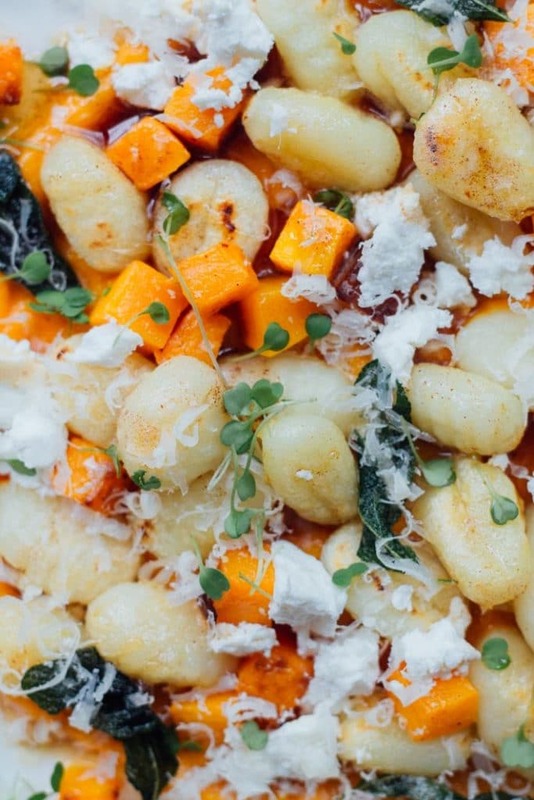 Scatter around gnocchi, pumpkin cubes and sage leaves. Divide goat’s cheese between plates and scatter around also. Drizzle over burnt butter sauce and top with grated parmesan cheese and rocket/arugula. If desired, sprinkle over extra chilli flakes. Serve immediately. I have tried making this dish many a times, unsuccessfully, with a regular fry pan but you really need a non-stick one for this. The gnocchi is notorious for sticking. I have a Circulon frypan which I love (note, I am not sponsored by Circulon). They can be a little pricey but I picked mine up on sale for 60 percent off. Thanks so much Alia! I know, recipes like this always make me think of fall.